On 24 June 2017, a public talk on Cervical Cancer was held in the Federation’s Lecture Hall. 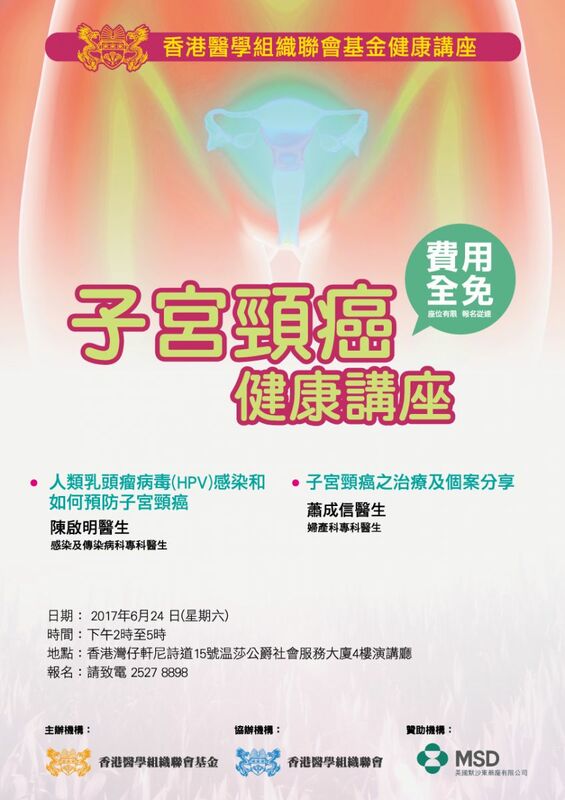 Cervical cancer has become the eighth commonest cancer among Hong Kong women. It is mainly caused by Human Papillomavirus (HPV). Most of these cases are curable if detected at an early stage. The Federation was privileged to have Dr Kai-ming CHAN, Specialist in Infectious Disease, to explainthe types of HPV infections and their preventionin men and women. Another speaker, Dr Nelson Shing-shun SIU, Specialist in Obstetrics & Gynaecology, and also Vice-president of the Hong Kong Society for Colposcopy and Cervical Pathology,shared with the audience the treatment options for patients with cervical cancer in different stages. Numerous questions from the audience and lively discussion during the Q&A session brought the interactive seminar to a successful conclusion.